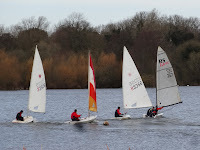 After an Easter, Club working party at which thirty members did stoic work in a blizzard and a season opener, which saw valiant attempts to break the ice, it was very pleasant to get down to Lackford Lake on Sunday to find that spring had arrived and that we could go sailing. Although much warmer than of late, there was a strong, shifty breeze across the lake, which provided some challenging conditions and good spectator entertainment for those who weren’t sailing – or swimming! Three races were held, with a mixed fleet of Lasers, Laser Radials, Vareo, Enterprise and Toppers venturing out on the water. Persistence and perseverance were rewarded as Nev and Charlotte, sailing their Vareo, were the only crew to complete all three races, despite several capsizes, earning them the first series win of the season. Next weekend sees the Sea Cadets and the first Topper Team Race Training session being held on Saturday and the first three races of the Spring Series being held on Sunday.